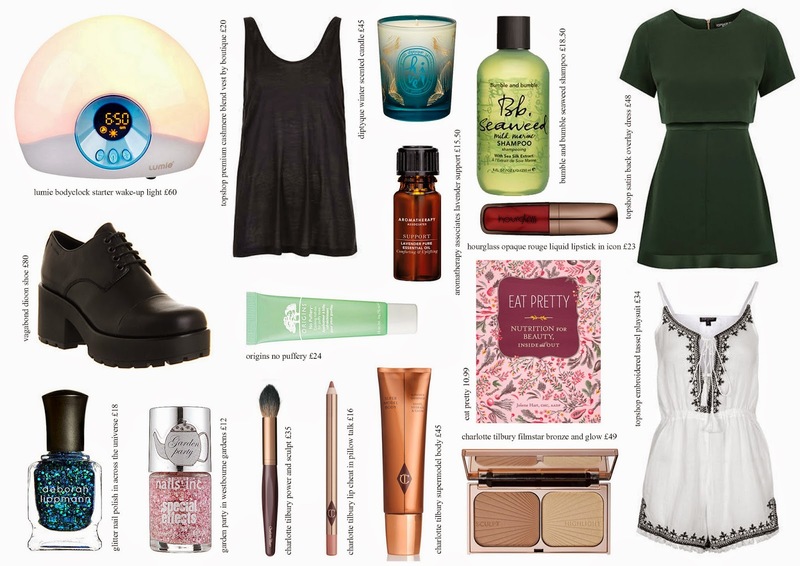 Christmas has been and gone, so along with a brand spanking new year brings a fresh beauty 'n fashion shaped wishlist. Thanks to good 'ol Santa, the delightful brand that is Hourglass entered my makeup stash, and I've become somewhat obsessed. A.k.a. Opaque Liquid Lipstick in Icon, plz be mine. Continuing on with the makeup shaped treats, Charlotte Tilbury is a constant feature on my blog wishlists. For contour, what else could it be other than the Filmstar Bronze and Glow? Of course one couldn't be complete without the other, so the Powder and Sculpt brush is another must-have. The typical smelly goodies such as the Aromatherapy Associates Lavender Support (for those stressy moments) and the Diptyque Winter Scented Candle are situated highly within this wee list. Also, from seeing the Lumie Bodyclock on Vivianna Does Makeup's channel I've seriously had my eye on getting one. Anything that could transform bad sleeping patterns into a thing of the past gets a humongous thumbs up from me! Shoes, just because, and these babies from Vagabond are b-e-a-utiful. Finally, Eat Pretty to fulfill my read-y needs, sparkle nails 1 and 2 and a few Topshop clobber pieces. Quite the list, it would seem, but I guess that's what happens when you read blogs right? What bits have you got your eye on right now? These all look lovely and such a great wish list. I really want to buy the contour palette myself.